I actually veganized it! My Family’s favorite. 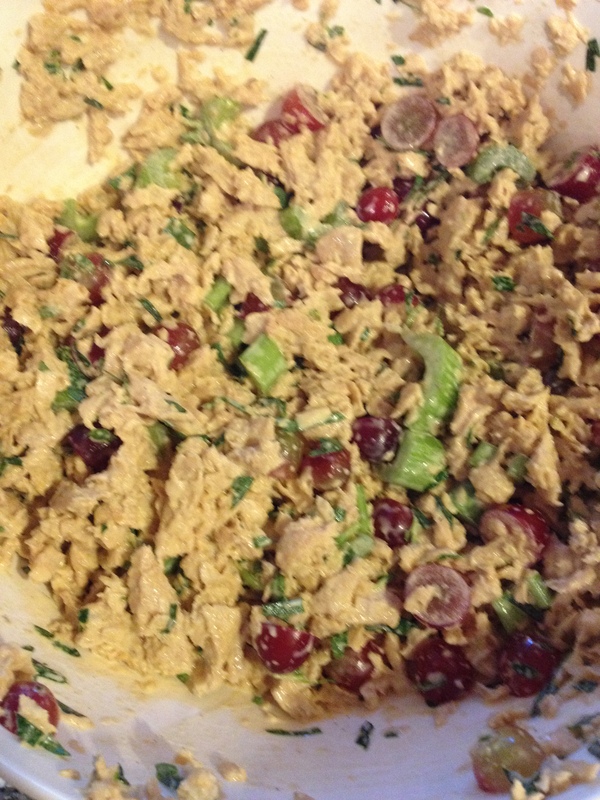 Tarragon Grape Unchicken (soy curls) Salad! 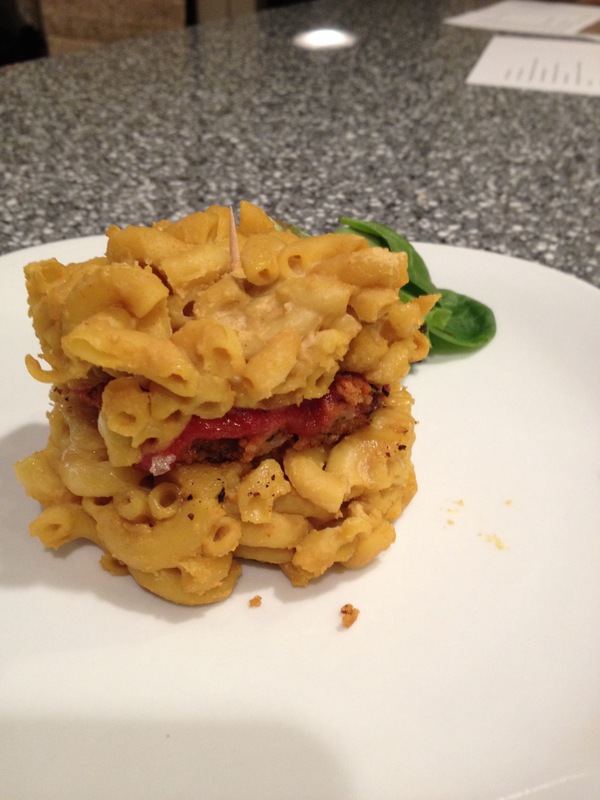 First of all, most of the credit for this recipe’s delicious flavors go to my mother, who makes the non-vegan version. I just basically veganized it. Second, I want to rave about how awesome soy curls are. I don’t know if any other companies make them besides the Butler brand, and whether I can find them locally (I usually buy them online when I make a veganessentials purchase) but they are the best. They have the best texture, taste, and are so versatile to work with. I’ve made them breaded and broiled, in buffalo tarts, and probably other things I can’t remember prior to this. All were delicious. This time I thought, hmm, I bet they’d make a good faux chicken salad! So I put a vegan spin on one of the rest of my family’s all time non-vegan favorite recipes, so now I can eat it too! This makes a lot, you can half it pretty easily I bet. First, re-hydrate the soy curls. Basically what I did was pour the whole package of those weird looking things into a medium sized mixing bowl, and then poured in the vegetable broth. The vegetable broth didn’t cover them completely, so I added enough water after that to cover them. I think you could use just water for the whole thing, but the soy curls absorb some of the flavor of the broth which makes it extra tasty. Let the soy curls sit in the bowl and broth/water mixture for 10-15 mins until soft. Drain most of the liquid out with a strainer. You still want them wet but you don’t want a lot of extra liquid, maybe only like 3 tbsp extra at most. Take out your food processor. Pour the soy curls into it. Pulse several times until the soy curls are chopped and the seasoning is combined into them. You do not want them mushy or pureed-like at all. Just kind of flaky and still a little rough. Keep your food processor out because you’ll need it again. Place the soy curls back in the mixing bowl. Remove the stems from the tarragon, and place into the food processor. Chop them finely but leave them still slightly whole. With a spatula, fold into the soy curls and vegenaise mixture. Add chopped celery and grapes, fold. And voila! It’s done! Gobble it up and tell me how it is! 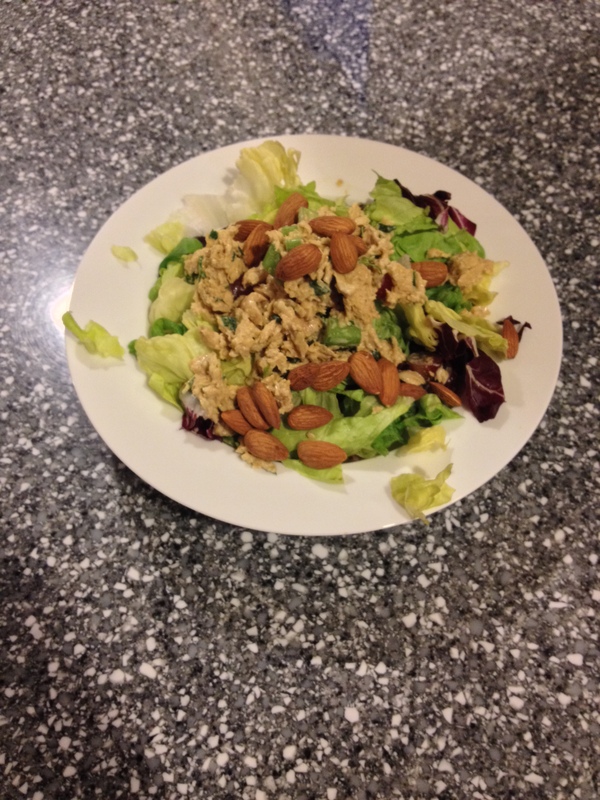 I’m going to place this unchicken salad over lettuce and add some raw almonds and eat this for my salad this week, so this is essentially my salad of the week post.